Do you trust your contractor to honestly answer your HVAC questions? When you’re considering hiring a new HVAC service provider to install a new unit, do preventative maintenance, or fix broken equipment, we know you have questions. Over the years, we have figured out the HVAC questions people are thinking but feel uncomfortable asking. That may be because you don’t think you’ll get an truthful answer from a provider who just wants to sell you services. How Will the R22 Refrigerant Phase Out Impact Your Commercial AC? The U.S. Department of Energy (DOE) and Environmental Protection Agency (EPA) have mandated phasing out refrigerants that have been commonly used for air conditioning and commercial refrigeration equipment for many years. R22 (also known as Freon), the standard HVAC refrigerant for decades, will become illegal to manufacture or import to the US at the end of 2019. In the meantime, supply is dwindling & prices are rising dramatically. How will the R22 refrigerant phase out impact your air conditioning or refrigeration equipment and the cost to maintain it? The dog days of summer may be behind us, but that doesn’t make cooling a factory floor any less important. Many factories operate around the clock, giving the equipment little or no time to cool down. Even when equipment is switched off, heat can build up and, with no escape, gradually raise the temperature on the factory floor. Here in New York City, those of us who lived through Superstorm Sandy tend to be more than a bit nervous about hurricanes. You don’t quite understand the magnitude of what can happen until you experience a storm like that, and have to deal with the aftermath. Since hurricane season is coming around again, we want to address a topic that’s a big concern here in Manhattan: hurricane preparedness for high rise buildings. Cooling is obviously one of the greatest health benefits of air conditioning. But it does more than just keep you comfortable in the summer. AC can make conditions better for preventing heat related symptoms or for recovering from illness. However, you may have heard some scary stories about air conditioning making people sick. Many people wonder, is AC healthy? Rest assured, the answer is yes, as long as you take proper care of your AC unit. Air conditioning health problems can be prevented with regular maintenance and cleaning. NYC Cooling Tower Cleaning Regulations: What If You Don’t Comply? Ever since the deadly outbreak of Legionnaires’ disease in New York City in 2015, there has been increased awareness of the health risks to millions of city residents and workers. And yet, recent data shows many building owners and managers are not complying with cooling tower cleaning and other safety measures now required by law. As a facilities manager for a retail chain, you probably don’t think what you do impacts your company’s bottom line. Or that you are in any way responsible for retail sales revenue. You would be wrong on both counts! When it’s only June and you’re already wondering if your aging air conditioner will make it through the summer, it’s not a good situation. Maybe you’ve been told it needs some repairs. That puts you in a tough position: do you spend the money on a commercial air conditioner repair to get through the summer? Or do you bite the bullet now and invest in a new system? Why Is Your HVAC Not Cooling Your Retail Store? When it’s the dog days of summer and you realize your HVAC is not cooling your store, it’s kind of an emergency! Every minute you go without effective air conditioning is like money draining out of your bank account. Or, more accurately, money never making it into your bank account because your customers are shopping elsewhere. What is an RTU HVAC System? Considering an RTU HVAC for your business? If you’re adding or replacing heating and air conditioning equipment in a commercial space, your contractor may recommend an RTU HVAC unit. What exactly is an RTU? It stands for “roof top unit.” So now you can guess that this type of HVAC equipment lives on the roof. It’s a self-contained unit that provides both heat and air conditioning for certain types of spaces. Keep reading to learn more about the RTU HVAC system, and find out if it may be a good choice for your commercial space. Usually our blog articles focus on our readers, their HVAC problems and concerns, and our best tips and advice for solving those problems. We’re not trying to sell you something: we understand that some of our readers just want information but don’t necessarily need our services at the moment. We’re happy to be your go-to source of reliable and trustworthy information about central air repair, maintenance and installation. That being said, we do hope you’ll reach out to us if you’re in the NYC metro area and you find yourself in need of central air conditioner repair service, preventative maintenance, or installation. Here’s why you’ll be glad you did. When you need a new commercial air conditioner, business owners and facilities managers often have no idea how to make the right choice. Like you might when buying a car, a computer or some other technology item, you might start researching brands to see which one gets the best reviews. Are HVAC maintenance costs breaking your facilities budget? For commercial facilities, your operations and maintenance budget must accommodate both planned and unplanned expenses. When it comes to your HVAC systems, does it seem like the unplanned expenses are getting out of control? That can include emergency repairs and having to replace failed equipment that you thought would last longer. The good news is, there is a simple and effective way to control those unexpected HVAC maintenance costs: with proactive planning and regular preventative maintenance. Your customers are the lifeblood of your business. You cannot underestimate the importance of giving them a comfortable shopping experience. How do you provide them with an appealing buying atmosphere? One way to keep your customers coming back is to make sure your shop’s temperature and ventilation are right all year round. There is no better way to keep your HVAC system working well than to learn about commercial HVAC service contracts and invest in one that is right for your business. For healthcare facility owners and managers, the tragic events in Florida following Hurricane Irma served as a shocking reminder: healthcare HVAC is a critical component to the health and welfare of your patients. Let’s take a look at the symptoms of a poorly functioning healthcare HVAC system. Then we’ll discuss what you can do to prevent and fix healthcare HVAC systems at hospitals, nursing homes, clinics, physical therapy and wellness centers. There’s a saying about saving power: the cheapest kilowatt-hour is the one you don’t use. HVAC energy efficiency starts with a mindset of using less and getting the most out of what you have. Since HVAC systems represent a significant portion of typical energy costs (experts say as much as 50 to 60 percent), these measures can make a big difference. Today we’re sharing with you the top 11 ways to increase your HVAC energy efficiency. Is your living or work space not as cool as you would like it? Are you noticing your indoor air is not fresh and maybe even musty? Have you heard any banging and whistling noises? If you answered yes to any of these questions, your ducts might be the cause of these HVAC problems. Let’s take a look at some common HVAC problems associated with duct deficiencies. HVAC Security: Is Your System Safe From Hackers? If you’re in charge of facilities, you’re used to thinking about the physical security of your workplace. But if you’re not an IT guy, you probably never thought it was your job to worry about the security of your data. However, if you’re using an automated building management system that interacts with your HVAC system, or remotely monitoring your comfort conditions, you do have to worry about HVAC security. There are plenty of expensive retail energy management systems on the market today. But when you’re facing today’s extremely competitive retail climate and tight profit margins, you’re probably reluctant to make a heavy investment. The good news is – you don’t have to spend a fortune on a retail energy management solution that will take years to pay for itself. Follow these retail energy management tips and start saving money right away. As a manager of commercial or residential buildings in NYC, you probably are all too familiar with the stress and aggravation that follows a major HVAC system breakdown. Tenants do not usually take in stride equipment failures that result in an uncomfortable living or working environment. LONG ISLAND CITY, New York – Jan. 16, 2018 ¬¬– Leading NYC HVAC provider Arista Air Conditioning Corporation announced today an exciting new partnership with XOi Technologies that adds an unprecedented level of transparency about HVAC repairs and service to the business/client relationship through the use of cutting-edge technology. As a property owner or a facilities manager, you probably feel at the mercy of the different contractors you call in to maintain your building or make repairs. One of the most important parts of facility management is making sure your building maintains a comfortable temperature and good air quality, and you’re aware that choosing an HVAC contractor is something you shouldn’t take lightly. So, let’s take a look at how to choose an HVAC contractor. How Does Workplace Ventilation Impact Employee Productivity? Improving employee productivity is a key goal for just about every large corporation and many smaller ones as well. If you are in charge of facilities and looking for ways your workspaces can support that goal, it’s smart to increase your workplace ventilation to improve office air quality. Do you ever feel like you’re getting short-changed by your HVAC company? If you have been dissatisfied with your HVAC vendor and suspect more attentive and knowledgeable service is available, your suspicions are correct. While there are many reputable HVAC contractors out there, only the best HVAC companies invest in leading-edge technology to enhance their already outstanding service. What exactly is an HVAC economizer? Any derivative of the word “economy” is appealing to us consumers because it indicates that we stand to save something whether it is from an operational or financial standpoint. So as you probably guessed, an HVAC economizer will save your business money on utility bills. Let’s take a look at how an HVAC economizer is a savings tool well-worth your initial investment. As a facilities manager, you know proper facility management is sometimes a thankless job. That fact is never more apparent than when you’re trying to get HVAC upgrades approved. Have you ever noticed an oily odor from your frying pans and other smells from the cooking process lingering long after the chefs retire their aprons for the night? Does it seem like it takes too long for smoke from the grill, the stove and steamy pots and skillets to dissipate? If your business has older HVAC equipment that’s been repaired recently, hopefully you used a trusted HVAC supplier. Many types of air conditioning repairs require adding refrigerant to the system. If your repair company bought refrigerant from the wrong source, you might have counterfeit refrigerant in your system that can be dangerous for occupants of your space. There have been reports of fires and explosions caused by counterfeit refrigerant. Find out how to keep your business safe and your air conditioning system damage-free. Even though we may enjoy warm late summer days, most of us don’t want that heat creeping into our air conditioned living or work space. Are you are concerned because your place is not cooling off like it should? Perhaps you’ve noticed warm air or lower than normal airflow coming out of your system’s registers or you’ve heard a hissing sound. Maybe you’ve observed water on the floor by your HVAC unit or seen ice forming on your evaporator coils. These are all telltale signs of an AC refrigerant leak. HVAC experts say an air conditioner should last about 15 to 20 years under normal conditions. However, many factors can reduce that life, including poor installation, operating conditions, system sizing, and neglected maintenance. In today’s uber-competitive business climate, companies need employees to be as productive as possible to achieve their goals. That’s why temperature and office productivity is an issue that’s getting more attention as the need for improved worker output increases. Like many, you are probably trying to find the barriers to productivity, and you may have come across the findings from IFMA about the top complaints from office workers about issues that impact their ability to get work done. Being too hot or too cold rank as the top 2 problems. If you work in an office (especially if you are in charge of facilities), this is probably not news to you! However, you may be wondering, what exactly is the relationship between temperature and productivity in the workplace? And what is the ideal temperature for an office? Read on to get the answers and insights about how you can improve the temperature and productivity in your workplace. As a business owner or someone who manages a building or office, you know all too well how energy consumption costs reduce your bottom line. The U.S. Environmental Protection Agency (EPA) estimates that there is roughly a 33-percent waste of energy usage in the average building. Let’s begin to look at how to save energy in buildings and how to reduce energy consumption in buildings. If your air conditioner is doing something unusual, you may be wondering if it’s a small problem you can tackle yourself, of if you need to call in the professionals. If you suspect that the problem may be a impending AC compressor failure, that’s a big concern. Since you’re reading this, chances are you’ve had a bad experience with an HVAC service provider. You may have learned that getting an HVAC service agreement with the wrong service provider can have costly consequences for your business. For starters, when important steps are skipped or executed poorly, you can experience major breakdowns that could have been prevented. And long downtimes before your system is repaired. Your air conditioning system is on the fritz and you’re thinking maybe it’s time for a replacement rather than another costly repair. Or maybe you’re concerned that the system in the office building you manage is not on top of its game or is approaching the end of its useful life. One option you might want to consider for your business is a VRF (Variable Refrigerant Flow) system. If you’ve got air conditioning equipment that you rely on, chances are you probably understand the importance of regular maintenance. But the trouble is, not all preventative maintenance agreements include coil cleaning. If your service vendor has been recommending this procedure, you may be wondering why you need to clean AC coils. Here’s a quick explanation followed by more information for those of you who want the details. One of the worst mistakes you can make when purchasing new HVAC equipment is choosing a unit that’s the wrong size for the space. Especially if the old unit was not providing adequate heating or air cooling, you may be tempted to go with a more powerful unit thinking it will provide more comfortable conditions. It won’t. When it comes to sizing HVAC systems, especially air conditioners, bigger is not necessarily better. What you want is a unit with exactly the right capacity and system design to meet the needs of the space. 1. The unit cycles on and off frequently. This is called short cycling, and it’s a common symptom of an oversized furnace or air conditioner. It means your system is working much harder, using more fuel, and providing less comfortable conditions. Properly sizing HVAC systems solves this problem. With the wrong HVAC sizing, your unit turns on and off so many times throughout the day that it creates a lot of wear and tear on the equipment’s parts. Any good NYC HVAC service company will tell you that as a result, you’ll have parts failing sooner than expected and increased commercial air conditioning repair or furnace repair bills. Not to mention the inconvenience and possible business interruption due to a broken heating or air conditioning system. 3. Reduced equipment life span. All that cycling is hard on your HVAC system. If you’ve purchased a unit with an expected life span of 15 to 20 years, that unit may fail in as little as 10 years. That’s an important reason why correctly sizing HVAC systems is critical. Incorrectly sizing HVAC systems wastes energy since the equipment uses the most energy when it starts up. Because it’s starting up more times throughout the day, and has a higher capacity to begin with, you will see a spike in your energy usage. The short cycling creates drafty, inconsistent heating and cooling, and you could also experience hot and cold zones throughout your space. 6. Humidity problems and poor indoor air quality. Here’s another reason correctly sizing HVAC systems is essential. Air conditioners that are oversized don’t run long enough to remove the moisture from the air. This results in too much humidity, which can cause a host of problems ranging from furniture and computer damage to the growth and spread of bacteria, viruses and dangerous mold. That powerful unit cycling on and off all day at full blast makes a lot of noise that can interrupt your business. If you’re running a restaurant, retail location or health facility, it can even drive away customers. 8. Higher cost to purchase, operate and maintain. Why would you pay more for something that’s going to cost you more to use and provide less comfortable conditions? This is a case where you don’t necessarily get what you pay for. Shelling out more for a higher capacity unit doesn’t get you more comfort. Properly sizing your HVAC systems gives you exactly what you need. In some cases, you may actually need a unit with a smaller capacity than you had previously. That’s because many buildings in NYC have HVAC equipment that was installed by a builder without adequate HVAC expertise. Sometimes builders make the same mistake as home and business owners, and choose a larger unit than is required. Also, when buildings are renovated there are often design and energy efficiency improvements made that decrease the capacity required for heating and cooling. It takes experience and the right tools to accurately determine the correct capacity for your space. To calculate the correct sizing for HVAC systems, certified commercial HVAC companies will perform a Manual J load analysis. This service takes many factors into account, including the square footage of your space, design elements, energy-efficiency features, building occupancy patterns and how the space is used. Most quality HVAC service providers use a software tool to do this calculation. Don’t make the rookie mistake of buying heating or cooling equipment with a higher capacity than you need. If you’re being advised to do so by an installer, get a second opinion before you waste your money. Are you getting bad advice about HVAC sizing? If you’re doubtful about the advice you’re getting from your current HVAC service provider, you may be thinking about switching but worried about terminating the relationship. There’s no good reason to stay with a provider that’s no longer serving your needs correctly. 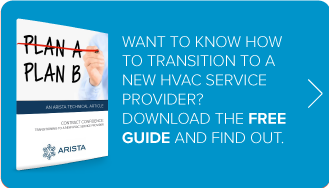 To learn more about how to make a smooth transition, take a look at our helpful guide to Contract Confidence: Transitioning to a New HVAC Service Provider. Why is my AC making a loud noise? The hot weather has hit and the cool air provided by your air conditioning system gives you welcome relief, but the noise coming from your air conditioner is quite another story. When your system was initially turned on, you thought the air conditioner noise would go away, but it hasn’t. Why is my AC not blowing? It’s incredibly frustrating when you just can’t get cool on a hot day, even though your air conditioning sounds like it’s working (it’s blowing). Is it you or is it really hot in here? You check the thermostat, and in fact the temperature is soaring well above the set temp. When you place your hand over one of the AC registers, you find your AC blowing warm air. You may expect your air conditioner to be cold, but if it’s covered in frost or ice, that’s not a good sign. When your air conditioner is freezing up, it can’t properly cool your space. And worse, if you don’t do something about it quickly, you can end up with water damage in your walls and ceilings as well as an expensive AC repair on your hands. Why is my AC leaking water inside the house? Finding water anywhere it doesn’t belong in your house is a major cause for concern. Not only are you worried about where the leak is coming from (and how much it will cost to fix it!) but you’re also concerned about damage to your home. When it’s your air conditioner leaking water inside, you need to act fast to prevent water damage as well as expensive repair bills. It’s the last thing you need on a hot summer day: your air conditioner keeps shutting off and the AC circuit breaker keeps tripping. You’re probably wondering what’s going on, and if there’s an easy solution. Do you need to call someone to fix the problem and if so, who should you call? The AC service company or an electrician? Did you ever walk into a hair salon and want to walk out after almost being overcome by chemical fumes from hair dyes, aerosol sprays and other products? You don’t want to be that salon and there is no reason why you have to be with the well-designed HVAC systems available today. What’s the Ideal Temperature for Art Storage? Whether you manage a museum or library that contains a significant collection or own a gallery that showcases the works of an emerging artistic talent, the ideal temperature for art storage and finding the proper temperature and humidity control system for your building are important topics to consider. As the owner or operator of a warehouse, you are concerned about warehouse temperature issues and whether warehouse temperature control improvements are warranted. By looking at ways to enhance warehouse temperature control measures, you have taken your first step in providing consistent warehouse temperature comfort and maximizing your dollars spent on energy. Have you ever walked into a health club and almost made an abrupt about-face because of the nasty air? Your gym or health club does not need to smell like your high school gym did after a wrestling match or intense basketball game. With proper air conditioning and gym ventilation you can rid your space of unpleasant odors and provide your clients with the healthy environment they were looking for when they joined your club. Let’s take a look how you can retain your customers and attract new ones by maintaining good air quality. Computer Room Air Conditioning: Is Your Equipment at Risk? It’s one thing when your air conditioner is not working properly at home, but it’s quite another thing when the air conditioning system is not performing at optimal levels at a business where computers are at the core of the operation. As a facility manager, you know a top-performing computer room air conditioning system is essential to commercial success. So let’s take a look at what can happen if the computer room air conditioning is not functioning at a high level. Maybe you’re looking to renovate your shop and have a particular style design in mind, but the unsightly HVAC ductwork is crimping your vision for your space. Or maybe you already have designed your boutique and have everything aligned with your distinctive taste, except for those ugly ducts. Believe it or not, you may be able to pluck those ducts from your space and have a beautiful air conditioner system. Imagine this – you can have an AC without ductwork. Following the Legionnaires’ disease outbreak in New York City in 2015, there has been a great deal of concern and confusion about what’s required for proper cooling tower maintenance. As a business owner, you want to keep your employees and customers safe from deadly bacteria. And if you’re in New York City and State, you must make sure you stay in compliance with NYC’s recent updates to regulations. Here’s an updated cooling tower maintenance checklist aligned with the new regulations. It may be hard to believe that coils could be responsible for taking down your commercial HVAC system or making it operate at a low efficiency level. Routine coil cleaning can help your system turn out a peak performance, reduce your energy costs and bolster the comfort level in your store, which will make it an attractive place to shop and work. Why Combine a Refrigeration & Commercial HVAC Service Contract? While combining facility services under one contractor is not always the best approach, some combined services are as a natural fit as a burger and fries. It makes perfect sense to put a commercial HVAC service contract and a refrigeration service contract under the same contractor’s roof and can actually provide for a more efficient operation, reduce your costs and your stress level. Are you providing your visitors with an inviting climate that will entice them to stay and shop and return to your store often? One thing that will chase your customers from your shop perhaps even before they make it to the register is a hot or stuffy store. If you currently use an HVAC company you are unhappy with, unfortunately you probably have firsthand knowledge of unacceptable service or a dissatisfaction with your climate control system. Rest assured, it does not have to be that way. Not all HVAC companies have been created equal and you can choose a company that will provide topnotch service and install quality equipment to match your needs. Let’s look at how to choose an HVAC company that can provide you with the services you deserve. If you’re in line for a new HVAC system installation, there is important information to digest before you undertake such a considerable capital investment. Your comfort along with your employee’s comfort and productivity depends on your comprehensive review of the myriad of options for your HVAC replacement; not to mention its impact on your wallet upfront and down the road. Let’s take a look at some of the things business owners and facility managers should take into account when sizing up a HVAC replacement project. You hear the coughing and sneezing, but are there indoor air quality solutions that can promote improved health, fewer employee absences and reduced insurance costs? By looking more closely at your indoor air quality and HVAC systems, you can offer your customers and employees an improved environment that will reap benefits for your business. Though you may not have related indoor air quality and HVAC systems with your employees’ health, OSHA (Occupational Safety & Health Administration) lists inadequate HVAC maintenance as a major cause of poor indoor air quality. OSHA claims poor indoor air quality can cause headaches, fatigue, concentration problems, skin rashes, and eye, nose, throat and lung irritation. Additionally, chronic health problems such as asthma are linked to indoor air quality and HVAC systems. Prolonged exposure to certain contaminants has even been connected to life-threatening medical conditions including heart and lung disease and cancer. So with so much at stake, isn’t it time to look at indoor air quality solutions? If you’re having difficulty comparing widely differing options when evaluating HVAC service contracts, it may be helpful to use the project management triangle as a guide. Are you familiar with the project management triangle? It’s a model that describes the relationship between three opposing constraints that impact work: time, quality and cost. It means that your choices in one area impact what you get in terms of the others. For example, if you decide you need the lowest price for a commercial HVAC service contract, that choice impacts what you get in terms of quality and/or timeframe. The rule of thumb you’ll often hear with regard to time, quality and cost is that you can choose any two, but the contractor controls the third one. When it comes to HVAC service contracts, we find that this rule breaks down: getting the best quality for the lowest cost is not a realistic option, no matter how much time you throw into the equation. However, understanding the relationship between these three constraints for HVAC service contracts is a useful exercise for focusing your priorities and clarifying what you’re getting for your money. How to choose an HVAC contractor for your business: why is it so hard? If you’re in charge of your company’s facilities, you’ve certainly had experience dealing with heating and air conditioning contractors. You’ve likely vetted quite a few over the years. Yet, since you’re reading this article, you are probably finding yourself disappointed yet again. You may be wondering why it is such a challenge to find an HVAC service provider that meets your expectations. The answer is: not every HVAC company is qualified to handle the challenges of commercial spaces, especially large corporate environments and businesses with multiple locations. Also, you want a company that’s willing to customize its service according to your needs and priorities. Read on to learn about how to choose an HVAC contractor that’s both willing and able to deliver superior service that goes beyond your expectations. If you’ve got a business located in an older building in an urban location, such as brownstones in New York City, chances are you have heating and air conditioning systems with ducts. And it’s likely that those ducts have been there for a number of years. Especially given the pollution levels in the city, a lot of nasty stuff can build up in those ducts over time: including dust, allergens, chemicals, microorganisms and mold. If you are experiencing comfort problems in your building, such as odors, inconsistent temperatures, and even allergies and other health issues, cleaning air ducts can make a big difference. When you’re renovating an older building for modern living (especially one in an urban setting like NYC), adding modern conveniences can be a challenge. Air conditioning is a prime example. Older buildings often don’t have the space to install the ductwork needed for traditional systems. Also, electrical systems may be sufficient to handle the load of today’s AC equipment. While upgrading the electric can be expensive, finding the space for air conditioning equipment is more of a problem. Doing it wrong can often mean damaging original plaster, floors and woodwork. Even in the best case, installing traditional equipment usually means giving up closet space or lowering ceilings to make room for equipment. That’s why it’s smart to consider alternative air conditioning systems for older homes, as well as small businesses renovating older buildings. In New York City, historic brownstone townhouses are frequently renovated for both uses. Here we will discuss the problems with older solutions, and introduce 3 more modern air conditioning options for older homes that you may not know about. New York is a historic city, settled by the Dutch in the 1600’s. There are actually quite a few structures dating back to the mid-17th century. As a result, we have many unique and beautiful historic buildings mixed in with the glass and concrete high-rises throughout the city. Many of those older buildings are protected by law and must be renovated according to strict rules for historic buildings conservation. That impacts an HVAC retrofit or replacement that’s typically needed to restore a historic space to a condition that works for a business or even a luxury residence. Here at Arista, we have been working on historic building renovations for decades (no, not since the 1600’s but we’ve been at this for a long time!). So we’ve learned a thing or two about the unique requirements of historic spaces for HVAC. Last week, we shared the first article in a two-part series about some of the issues you need to address with an HVAC retrofit or replacement for historic buildings. In part 1, we began with a list of 9 DOs when installing HVAC solutions in a historic space. Today, we’ll reveal the all-important HVAC DON’Ts for historic buildings conservation in part 2. Even when you’re making structural fixes or cosmetic changes to meet the needs of a new commercial tenant, it’s possible that the existing HVAC system, or components of it, can be salvaged for the sake of historic buildings preservation. That’s especially true of the heating system. For example, you may be able to keep the old radiators and replace the old boiler with a new one. Or, consider an HVAC retrofit to add AC to parts of the building not cooled by an existing system. There are some situations where a repair or an HVAC retrofit may be a viable option for historic buildings conservation. There’s one caveat to be aware of, though: think carefully about keeping AC systems that use the old R-22 refrigerant. That refrigerant is currently being phased out due to the environmental impacts, and getting R-22 is becoming more difficult and expensive every day. That means you may need to consider a replacement system that uses one of the newer refrigerants. If an HVAC retrofit will not meet your needs, don’t assume you have to replace an older system with the same type of older system! There are newer HVAC technologies that have significant benefits for historic buildings. A variable refrigerant flow (or VRF) system is one such option. For one thing, these system don’t typically require ductwork, which can be a boon when you’re trying not to damage existing walls, ceilings and building structures. Also, the system consists of multiple air handlers which are smaller and take up less space. What’s more, these new systems are extremely quiet, energy efficient and customizable for zoned operation. In many buildings, it’s standard practice to cut holes through exterior walls to install what’s called “through the wall” HVAC units. This is usually forbidden by building regulations for historic buildings conservation. That means an HVAC retrofit to add a small unit onto an existing system might not be an option. In some cases, you’ll have to get creative using existing penetrations through exterior walls, and consider ductless systems. Just like you have to be creative to avoid cutting through the exterior, it takes some expertise to find solutions that avoid altering architecture in a historic buildings conservation project. Here are some of the things you should avoid doing whenever possible: avoid dropping ceilings, covering window openings, masking historic features or altering spaces to make room for HVAC equipment. If you are creative, there is usually a way to do it without destroying original architecture. We could tell you so many stories to illustrate that point! Take a look at this previous blog to see what we mean: Residential HVAC Services: Innovation Improves Cooling in NYC Luxury Homes. Aesthetics is a primary concern for historic buildings conservation. That includes both the interior and exterior of the space. Whether you are completely replacing the HVAC systems or only doing an HVAC retrofit, placement of equipment is extremely important. That means, don’t put condensing (outdoor) AC units on a visible part of the roof. Don’t add vent pipes that ruin the asthetics of the roof line. If you must put a condenser in a visible area outside, at least use some creativity to hide the unit. An HVAC retrofit or replacement, done as part of a historic buildings conservation project, requires the expertise of trained HVAC professionals. Be sure you choose a company that is experienced with older buildings, because if you’re not careful with the installation you could end up with condensation damaging the historic building structure. Water leaks can stain walls and ceilings, and uncontrolled humidity can damage woodwork and expensive finishes. 7. DON’T skip regular preventative maintenance! As we stressed in our part 1 article, investing in HVAC preventative maintenance is a smart move for any business, but it’s a must for those located in historic buildings. Not only are the consequences higher when something breaks (see the previously cited article about water leaks!) but the costs for repairs can be higher because it’s harder to access equipment and ventilation systems without harming building finishes. Imagine the repair costs and building damage that you could face if a blocked drain causes a slow water leak that spreads mold through the walls before anyone notices? That’s just one reason that our last DON’T may be the most important of all. Learn more: Air Conditioning Maintenance Doesn’t Cost. It Pays. If you’re renovating a historic building in New York City, the HVAC solutions you choose can be a very important decision. It may not be the first thing on your mind, compared to structural and design decisions. However, choosing the right HVAC systems and installers means you get the comfort conditions needed for the intended use of the space, while also doing a good job with historic building preservation and maintaining the character of the building. You are considering the renovation of your business space in an older building and are faced with many important decisions and among those is choosing the right HVAC system. You probably feel comfortable with many of your choices such as the best floor plan to meet your needs. But when it comes to selecting a new HVAC system, you may feel lacking in expertise and chilled by the thought of choosing the right HVAC system for your space that is on the cusp of renovation. Here is some basic information that should help break the ice in the decision-making process and steer you in the right direction in making best choice for your business. There are about 24,000 restaurants in New York City alone. Restaurant customer retention can be difficult to manage in that kind of climate. With all of those choices, how do you motivate your customers to keep coming back for more? Luckily, Restaurant Week will be stirring up some fresh interest in the local dining scene and hopefully drive some new business your way. You want to make a good impression, so what’s a good way to turn them into repeat customers? Make their experience stand out, and offer something better than the rest. Here are some great ways to boost restaurant customer retention. Here’s one fact you probably already know: the success of your restaurant is about much more than the food. Restaurant comfort is a big issue for diners, and a prime reason they will choose to frequent your establishment, or not. Yet (as you probably realize since you’re reading this blog!) getting restaurant comfort right it not as easy as it seems. Just think about your own experience. It’s probably something like this: your patrons are constantly complaining about being too hot or too cold, or being bothered by drafts from your AC blowing directly on their food. And making it too loud to carry on a conversation. At the same time, your kitchen is sweltering to the point that people are ready to pass out from the heat. Even worse, you might have kitchen odors migrating to the dining room. That’s not a pleasant experience for your diners, either. We’ve heard lots of stories like this from the many New York City restaurants we have serviced over the years. Certainly you’ve experienced your staff fiddling with the thermostat in a desperate attempt to improve your restaurant comfort. It’s even worse when you catch your customers doing that! Read on to learn more about why restaurant comfort is a tricky issue. Then we’ll reveal how the right combination of specialized equipment, HVAC system design and maintenance can improve environmental temperature control and solve your problems once and for all. As equipment ages, it becomes more inefficient. As a result, it’s increasingly likely to break down, provide inconsistent comfort, and drive up energy costs. That’s why meeting the objectives above requires having a plan for proactive HVAC replacement as units reach a certain level of inefficiency. Business owners, you know your employees are your #1 asset and a huge part of your business’ success. This is the time of year to let them know you recognize what they contribute to the organization and to you personally. When it comes to holiday gift ideas for employees, think beyond the generic gift card or fruit basket to make them feel truly valued. Of course, everyone likes cash. But you would probably not be reading this if that was an option! Instead, peruse this list of holiday gift ideas for employees for some creative holiday gifts that are sure to please and send the intended message. It’s the most wonderful time of the year! The NYC streets are teeming with shoppers and you’re looking forward to your most profitable holiday season yet. Hopefully Black Friday was successful for you and a sign of healthy sales to come over the coming month. But are you doing everything you can to get shoppers into your stores and entice them to spend? And are you doing everything you can to control costs and maximize profit? Here at Arista, we have worked closely with NYC’s retail business community for decades. Today we are sharing some holiday tips from some of our most successful retail customers about how to maximize profit this holiday season. This blog post shares proven strategies and advice for implementing modern workplaces with smart buildings technology from Ian Morley, Chief Strategy Officer for Serraview, a technology solutions provider for the agile workplace. BONUS: you can even use smart buildings technology to improve employee experience. Wondering where to start? Read on to learn about smart HVAC and space optimization technology designed to modernize your workplace while also cutting facilities expenses. Can you believe it’s nearly Thanksgiving? With the holiday rush about to hit, replacing your office AC is probably the last thing on your mind. However, if you experienced problems with your office air conditioner all last summer, you’d be very smart to think about upgrading it now. While it’s tempting to wait for spring to deal with your office AC problems, the fact is that autumn and winter can actually be the best times to buy a new office air conditioner. Read on to learn why, as well as important information you need to make a good decision and get the best possible pricing. Walk into a modern NYC office, and you’ll find a very different environment than you did just a few years ago. For decades, a ring of private offices surrounding a central cubical farm was the norm. Today, modern offices are much more open, featuring different types of spaces designed for team collaboration, individual focused work and everything in between. While open environments are a boon for business in many ways, sound distractions such as HVAC noise can lower productivity in these environments. Read on to learn some effective strategies for HVAC noise reduction, as well as one way you can use HVAC noise to your advantage. Corporate office space is undergoing a rapid transformation. Traditionally, these spaces included a ring of private offices around the perimeter of the space, with cubical farms occupying the center. Today, companies are moving to more of an open office plan, which requires different considerations for HVAC system design. Most of those perimeter offices are disappearing, as companies want space that takes advantage of natural light. And the cubicles are being replaced with workspaces designed for specific types of activity, such as pods for quiet concentration and team lounges for collaboration. How does all this change impact HVAC system design? Read on for some important strategies. Here in the NYC area, it’s that frustrating in-between season again, where you don’t know how to dress from one day to the next. Having to changing your clothes several times a day can be annoying, but keeping your space consistently comfortable in this weather is another challenge altogether. Some areas wind up too cold while others are too warm. Did you know that you can get an HVAC system that provides simultaneous heating and cooling? Read on to learn more about VRF technology, a sophisticated type of HVAC system that provides simultaneous heating and cooling (as well as other advantages over conventional systems). We’ll also identify as the types of spaces that can benefit most from this technology. It’s amazing how fast the weather is turning this year here in the New York City area. Just a few weeks ago you were probably running the AC, and now you’re probably thinking about turning on the heat. Not so fast! Have you completed your fall HVAC maintenance yet? To keep the occupants of your space comfortable and your systems in great shape, now’s the time to tackle the HVAC maintenance checklist. Read on to learn what needs to be done to your heating and cooling systems, as well as why it’s in your best interest not to skip the essential tasks on the HVAC maintenance checklist. Learn more about the WHY behind fall HVAC maintenance in NYC by reading this: 4 Consequences of Fall Furnace Maintenance Neglect. Use these checklists to start a conversation with a certified provider of HVAC maintenance in NYC or in your area about what’s included in their service agreement, as well as what HVAC maintenance checklist tasks are needed for your equipment. HVAC Repair in NYC: Does Your Tech Get Enough Training? It’s not rocket science, getting competent HVAC repair in NYC, right? At least you might not think so. So then why are you experiencing so many problems? Customer service and scheduling issues are bad enough: making you wait days or longer for an appointment, showing up late, then taking even longer to get HVAC repair parts needed to complete the job. But when the problems go deeper and involve the ability to correctly diagnose and fix problems, that’s another matter entirely. The fact is, HVAC repair (in NYC especially) is becoming more and more complex all the time, as vendors move toward proprietary technology. The issues you’re seeing may very well be due to inadequate training. Read on to learn what you must look for in a service provider of HVAC repair in NYC, specifically related to proof of expertise and ongoing training. NYC Disaster Recovery: Is Your Business Ready for the Next Big Storm? For business owners in the New York City area who lived through Superstorm Sandy, this can be an anxious time of year. Even though hurricane season is technically on the wane, that doesn’t mean we are safe. After all, Sandy struck at the end of October. Many of us are keeping an eye on the forecast and worrying every time a tropical depression forms. There’s a good reason for that concern. If you’re not prepared, storm damage can severely impact your business, or even put you out of business for good. Unfortunately, worrying won’t protect your business in the event of a major storm. A NYC disaster recovery plan can. Trying to decide on the right ductless AC system for a NYC luxury residential or light commercial space? It pays to consider variable refrigerant flow or VRF systems for the ultimate in comfort and efficiency. While it may be unfamiliar to some, VRF technology is not new. In fact, it’s been the ductless AC system of choice in Japan and Europe for decades. These ductless AC units have been gaining in popularity in the US over the past 10 years or so, particularly in the Northeast, including New York City, and on the West Coast, according to a report earlier this year by ACHRNews. Read on for a review of when you may want or need to choose a ductless AC system in NYC, and why VRF is an ideal choice. So what is ventilation exactly, and how does it work with heating and air conditioning systems to maximize your HVAC comfort? If you’re a small business owner, you’re probably used to getting things done yourself. Maybe you save money by making your own desk supplies and organization, or maybe you’ve built a bookshelf or a storage system. DIY can be a great solution for saving a bit of your budget. But if you’ve ever stared down a failed Pinterest project, you’ll know the most important part is knowing when you’re in over your head. Check out these air conditioner maintenance tips to do DIY the smart way. What would happen if you just stopped filing papers? Or if you stopped checking your email? What about if you- horror of all horrors- never refilled the coffee machine?! It’s easy to imagine the resulting chaos from such a scenario. But there is another under-appreciated staple of the office routine: your AC air filter. What would happen if you didn’t change your AC filter? It’s hard to believe such a small paper part could make a big difference in air quality, but it does. Think of cleaning the air like cleaning the rest of your building. It would get pretty bad if you neglected it for a month. Consider all the dirt and grime you’d see on the floors, on counters and surfaces, and in bathrooms. That’s equivalent to what accumulates in your filter in a given month. What are the consequences of this uncleanliness? Let’s look at what happens after you don’t change your AC filter to find out. We know it’s frustrating when your AC is not cooling your business effectively. Especially when it’s an issue that happens intermittently or has developed slowly over time. Complaints from your employees are increasing, and you’re even worried about losing business. You may be wondering if your equipment needs repair or replacement, or if it’s not really broken at all but something in your environment that’s changed. What can you do to get to the bottom of the problem? The tricky part is, there are many issues that can result in your AC not cooling enough. Read on to learn more about the common problems you should know about, so you can take the appropriate action. Our theme for this month’s blogs is “Things Techs Wish People Knew About HVAC,” and that starts with a very basic understanding about how air conditioning works. Why should you know or care how AC works, as long as it keeps your space cool? You’re more likely to notice sooner when something’s not working right, and call for help. In many cases, that awareness can turn small problems from turning into bigger (and more expensive) problems. So, here’s a basic primer that explains how the most common air-cooled systems & how air conditioning works. It’s easy to stay vigilant about keeping your office or apartment building clean when having a neat space means making a good impression. But what about a mess you can’t see that’s lurking inside your air conditioning system? That kind of grime can do more than make a poor impression; it can lead to health problems. That’s just one reason why HVAC system cleaning is so important. Case in point: in 2015, New York City was affected by health scare known as Legionnaires’ disease. This dangerous sickness was reported in certain large buildings and offices, and was eventually linked back to contaminated HVAC water cooling towers. Since then, legislation has been introduced to keep water cooling towers clean and prevent further infections. This situation goes to show that it’s not just fear mongering; HVAC system cleaning is a vital part of keeping your space healthy. When August finally rolls around, it can be hard to remember that you were wishing for this heat in January. A hot day on the beach is nice, but the humidity in summer leaves you sticking to your chair. If you find yourself longing for the chilly days of winter, check out these ways of staying cool in summer before you resort to that in-office water balloon fight. In space, the “Goldilocks zone” is the area around a sun where the temperature is habitable to life. In the office, differing temperature preferences can feel as far apart as the sun and moon. Today we’re helping you bridge the gap by finding the ideal office temperature to satisfy all your employees. Don’t be deaf to your employees’ complaints, because a comfortable employee is a productive employee. Here are some strategies you can use to make your office not too cold, not too hot, but just right. Isn’t air conditioning supposed to remove humidity? So why is yours not doing the job? If you’re sweating your way through another muggy August, read on to learn more about HVAC humidity control and why your AC might not be up to the task. Then we’ll tell you 4 ways you can get an older unit to remove more moisture so your space doesn’t feel like a tropical jungle. Is Too Much Humidity Hurting Your Health? This time of year, it can feel like you’re living in a steam bath. August inevitably brings too much humidity and heat, and it can be difficult to escape the uncomfortable effects, even indoors. Are you having trouble maintaining your energy and focus with too much humidity in the air? Even hunting down Pokémon is too much effort in this weather. It’s enough to make you wonder exactly how the high humidity levels are affecting your body and your health. How are indoor humidity & health related? If you’ve got an older air conditioning system (and you’re reading this article!) chances are you’re familiar with what happens when you’ve got a refrigerant leak. You begin to notice that your AC is not cooling very well, even though the fans are blowing and the air flow seems fine. Over time, days or even weeks, the problem gradually gets worse, even though the system is running more than usual. Finally, you put your hand up to the register and you feel warm air blowing out. That’s a classic sign of a refrigerant leak. Not again! Read on to learn about what causes a refrigerant leak to happen, how to get it fixed right, and options for making sure it doesn’t happen again.